The original field of 21 candidates has been winnowed, leaving Chicagoans with 14 options for the city’s next mayor. With time running out – early voting is set to begin Monday – the Chicago’s Board of Election Commissioners made final rulings Tuesday. Commissioners decided Circuit Court Clerk Dorothy Brown did not submit enough valid signatures to qualify as a candidate for mayor; entrepreneur Neal Sales-Griffin did, and he will be on the ballot. That means the field is, in alphabetical order: Gery Chico, Bill Daley, Amara Enyia, Bob Fioretti, La Shawn Ford, Jerry Joyce, John Kozlar, Lori Lightfood, Garry McCarthy, Susana Mendoza, Neal Sales-Griffin, Toni Preckwinkle, Paul Vallas and Willie Wilson. If none of the candidates get more than 50 percent of the vote in the Feb. 26 race, there will be a runoff between the top two vote-getters April 2. Brown and her attorney tried to argue her campaign didn’t have time to review the last-minute findings of an election board hearing officer, and that election commissioners inappropriately hired amateurs to determine whether her signatures were valid. “We feel that that was an unfair and unjust process. It’s … against, it takes away a voters’ opportunity to say an individual should be on the ballot,” Brown testified. Board of Election Commissioners Chair Marisel Hernandez said Brown’s campaign had plenty of time to review and fight the case file. “How much more do you need? We have … to decide who is on the ballot and who is not. We have early voting that’s supposed to have started already and we have given you a lot of time to go through these pages, if you wanted to,” Hernandez said. (Six black candidates remain on the ballot: Enyia, Ford, Lightfoot, Sales-Griffin, Preckwinkle and Wilson). 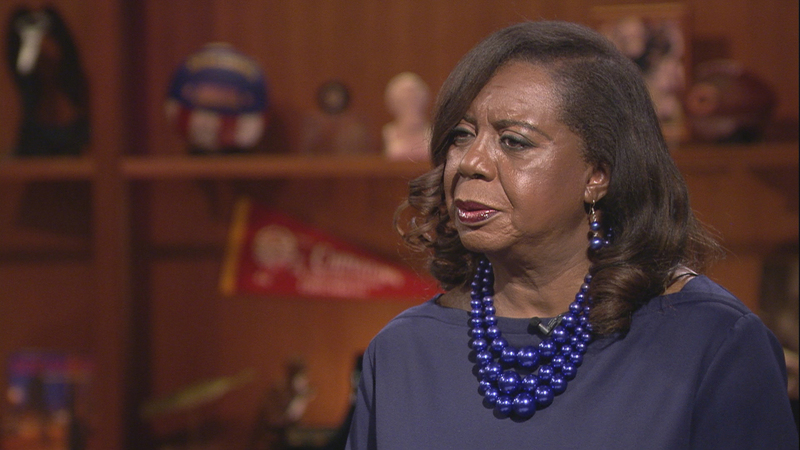 Dorothy Brown appears on “Chicago Tonight” in April 2018. On Tuesday, Jan. 22, 2019, Brown was kicked off the ballot in the Chicago mayor’s race. While Brown could challenge the ruling in court, she indicated afterward at a press conference that she will not go down that path. Instead, she will endorse another candidate. Brown will pointedly not consider backing Preckwinkle, who recently won another term as president of the Cook County Board. “Toni Preckwinkle and the Chicago machine obviously feared us and rightfully so, because we are a force to be reckoned with and we will continue to be a force to be reckoned with,” Brown said. Preckwinkle and Wilson, a businessman who’s largely self-funding his campaign, both challenged Brown but last week Wilson withdrew his objection. Wilson sent a statement, as if to drive home that there was no quid pro quo. “I also would like to publicly state that she is under no obligation to support me or my campaign in any way. My withdraw last week was unconditional and the right thing to do. I wish Ms. Brown all the best!” the statement read. As Brown supporters jeered, Preckwinkle’s attorney, Keri-Lyn Krafthefer, took to the microphone before assembled reporters to push back on Brown’s accusations. “Dorothy Brown wasn’t a threat. It’s about, she did not follow the rules that all candidates for mayor have to follow, so we were trying to uniformly apply that. We were not the only candidate that challenged people. Some challenges were successfully, some were not but it’s about who followed the rules and who didn’t,” Krafthefer said. The challenge process is in inexact science, inherently political in nature – it’s one that backers say successfully roots out fraud and protects ballot integrity, but which opponents criticize as nitpicky and intended to give an advantage to longtime candidates with large field operations (and the money and connections to support them). Sales-Griffin said it has him with a lot of catching up to do: Filling out questionnaires and RSVP’ing to candidate forums he’d been excluded from while his candidacy was in limbo.